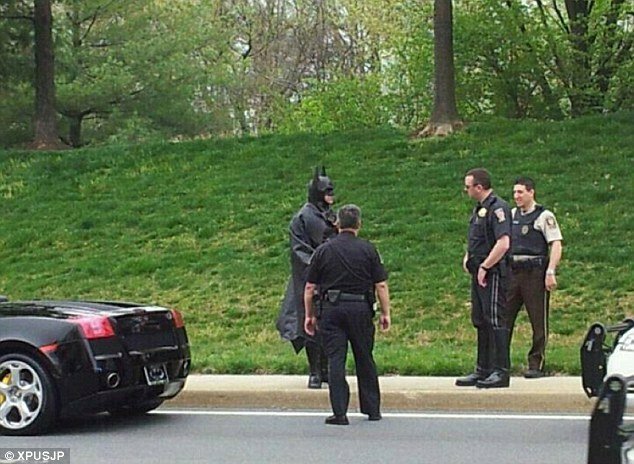 Batman was pulled over earlier this week after Montgomery police saw he had no tags on his black Lamborghini. Lenny B. Robinson, the man dressed as Batman, was heading to a local children’s hospital, according to Montgomery County Captain Paul Starks. According to Capt. Paul Starks, a man dressed as Batman was pulled over on Interstate 29 in Montgomery, Maryland, outside of Washington, DC. However, Lenny B. Robinson had both front and back plates with him. “The car was registered, and the man explained that he goes to hospitals and does work with kids (while in costume),” Capt. Paul Stark explained. But it would appear he was short for a changing room – the Lamborghini is usually the vehicle of choice for Batman’s alter-ego, Bruce Wayne. Capt. Paul Stark said that Lenny B. Robinson was not charged. “They had a discussion about the law, and he let him fly so to speak,” he said. “The police officer and Batman had a discussion, and he said next time, get it right,” Capt. Paul Stark said. The precinct released pictures of the unusual event on both their Facebook and Twitter pages. As for the reason why he didn’t have plates in? Capt. Paul Stark speculated that Lenny B. Robinson didn’t want to “ruin the effect” of being Batman – thus going completely method. A tipster told Jalopnik that the plate’s screws simply would not fit with the luxury car. The Montgomery police tweeted that the “batmobile was not towed”. Lenny B. Robinson, it seems, loves showing up in public dressed as the Dark Knight. From the look of his Facebook page, the business owner often makes appearances, and especially loves brightening young children’s days. This isn’t the first issue the erstwhile Batman has faced. Last Halloween, his car got a flat tire as he was again driving to a Washington-area hospital to visit sick children. He posed with Howard County Police Department’s Brandon Stickles, one of the officers who responded to the call. Lenny B. Robinson still managed to get to the hospital, thanks to a ride from a friend.